See if, when, how often and where an email was opened, and the device or browser used. This delivers actionable insight to make better selling decisions so you can focus on your best opportunities and prospects. An email opened on iPhone and then within Chrome or Outlook could mean it has attracted some serious interest. A persistent sidebar displays in real-time who’s opening your emails. It provides a quick and easy overview of the emails attracting interest - whether they were sent minutes, hours or days ago. An email opened many times in a short period of time may be offer the information you need to follow up on a hot lead. 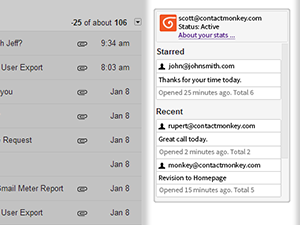 After the ContactMonkey plugin has been installed, it starts tracking all your email automatically. There’s no need to set things up or change how you use Outlook or Gmail. 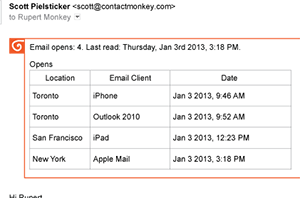 It means you can get up and running in minutes, and capitalize on the power of ContactMonkey. There will be plugins for more email clients soon, so stay tuned. 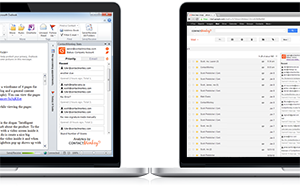 Try ContactMonkey for a 14 day FREE TRIAL. US$4.99 (approx. €3.80) per month - Sweet! US$49.99 (approx. €38.15) per annum - Sweeter! Let ContactMonkey power you team. Contact us for pricing.